This story about Didi Chuxing was first published by Gas2. Didi Chuxing is the largest ride-hailing company in the world, with more than 450 million users and 21 million drivers. Each day, it provides rides to 25 million customers — twice as many as all the other ride-hailing services combined. Most of its users are in China, but it has plans to aggressively expand operations into other markets. Didi Chuxing also announced this week a new partnership with NEVS, the successor to the former Saab automobile company based in Trollhätten, Sweden. NEVS is now owned by a consortium of Chinese investors. In a press release, the two companies said they will focus on developing self-driving cars to satisfy the transportation needs of the world in the near future. 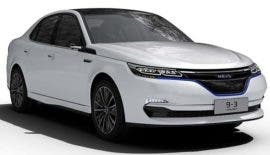 The first NEVS cars are based on the original Saab 9-3 sedan, which still looks remarkably fresh considering it was first penned more than 10 years ago. DiDi and Uber were slugging it out for dominance in the Chinese ride-hailing market a year ago. Both companies practically gave rides away for free in order to build their respective client bases. DiDi eventually bought out Uber’s interest in the Chinese market for a paltry $100 million. DiDi is committed to environmentally friendly mobility technologies from carpooling to on-demand minibus services. Its focus on reducing urban congestion and air pollution resulted in eliminating 1.44 million tons of carbon dioxide that would otherwise have found its way into the atmosphere in 2016. It is already the largest ride-hailing service in the world and plans to continue being the industry leader for years to come.